Your students will be home for the holidays, but your gift will keep on giving whether they’re at home or at school – the love of reading! Start a tradition this holiday season that promotes the joy of books with digital resources available at no cost from INFOhio. With quality eBooks from BookFlix and Storia, as well as seasonal reads from popular magazines for kids, tweens, and teens, INFOhio provides a variety of reading content for students to read wherever they spend their holiday. There are many ways to encourage literacy during the holiday break, and INFOhio is sharing tips and tools that keep giving all year. Don't miss this present from us to you - Happy Holidays! 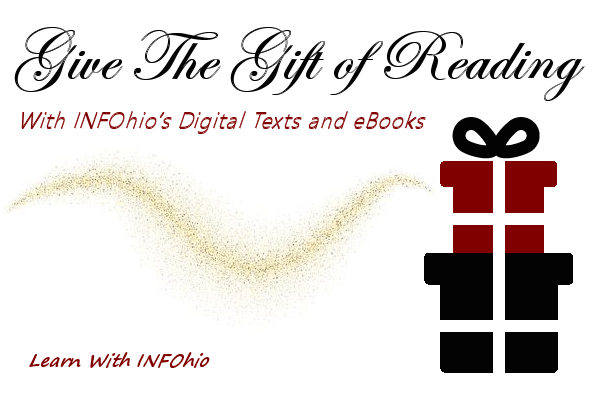 Use this url to bookmark or link to Give the Gift of Reading With INFOhio’s Digital Texts and eBooks! : https://www.infohio.org//pd/webinars/recordings/item/lwi20181129. Emily Rozmus has been an Integration Librarian for INFOhio since December 2013. Before this, she was the district librarian and high school English teacher for Mechanicsburg Exempted Village Schools. In her 20 years there, she worked on teams to implement curriculum, develop district growth plans, integrate technology, create instruction for information literacy, and foster teacher development. At INFOhio, she focuses on helping educators use INFOhio resources to improve early literacy. Her work has resulted in instructional "bags" for Ohio teachers, early literacy webinars, partnerships with like-minded agencies, and numerous statewide presentations to teachers, administrators, and educational leaders in Ohio. In her free time, she reads, enjoys time with her husband and three teenaged children, and plans for her next big adventure in life.